Need an awesome rod for some extreme catfishing? Of course you do, that’s why you clicked in right? Well, catfishing from a bank or from a big river, if it’s small or a trophy size catfish, only the best catfish rods can make that happen! Lemme tell you folks, you are absolutely in the right place. Welcome to Top Review Geek. We are going to show you some of the best catfish rods specifically made for catfishing! And don’t miss the Top Review Geek Best Pick table and the FAQ section below! If you are a beginner angler, it will help you a lot to hook up these monsters. So, let’s get started. Either it is a small sized channel catfish or a giant-sized flathead or blue catfish, you definitely need a different kind of setup for catfishing. You will find a huge list of catfishing rods in the market but the shocking fact is, very few of them can be said “Awesome”! It’s an overwhelming task to find Fishing Equipments like the perfect catfishing rod, you can waste a lot of bucks finding a perfect one. Just have a look to our list, we did the boring research work for you. So after tangling with catfish rods, here are best catfish rods we found. Have a look! 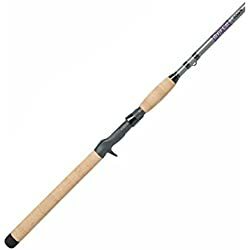 Description: This OKUMA Battle Catfish rod is a great choice for beginners out there cause it’s a spinning rod and exactly made for catfishing. Some say this piece is the best catfishing rod in the market! Though we have a different opinion it’s true that this one is a piece of gem! Size: It offers 3 different sizes. Sizes are 7.6 feet, 8 feet, and 10 feet. You can cast 60-70 yards easily with any rod, but if you want to cast a long distance then you should take longer rods. Power: Of course it’s not an ultralight rod, we are talking about catfishing rods here. It’s a heavy powered rod, exactly what you need to catch a trophy catfish. This one is ready to take any challenges, we are talking about serious catfishing here. A medium heavy rod is best for all kind of catfish species but a heavy action rod won’t be a problem catching them. Action: The Okuma Battle Catfish is a fast action rod, that means it flexes in the upper ⅓ of blank! Perfect action for catfishing. Material: One of the main reason behind its vast popularity is, it’s made out of E-Glass. the material is very strong and durable and the rods hold up well. They are strong and powerful which results in a heavier in weight and less sensitive rod than other styles of fishing rods. 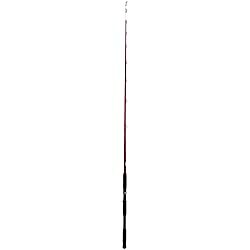 An e-glass fishing rod usually has a strong backbone. As I told you, it’s made for hook up the giants. Handle: The handle offers EVA fore grip for comfort and cork rear grip which makes it much fun to handle the rod. Trust me, this handles are really comfortable and have a great grip. So, that’s pretty much all of it. Lastly, if you wanna go for a big monster, a trophy catfish then this Okuma Battle Cat Catfish spinning rod is what you are looking for. Description: Wanna do some serious catfishing in an affordable mid-range priced casting rod? Rippin Lips Super cat Casting rod is the rod fits for it perfectly. It’s a fabulous rod, there’s so much I wanna share about this rod cause truly it’s a piece of gem. The rod we are talking about here is 8 feet long, there’s also a 7.6 feet long rod available from Rippin Lips. With increased height, you can cast longer. Choose your distance from these 2 available sizes. Rippin Lips rod is built to fight these catfishes so obviously it’s a heavy power rod, so powerful that it can handle a giant catfish. Though it’s a heavy rod, amazing fact is it’s considerably lightweight! The action you get with this rod is medium fast. It’s a bit sensitive which is a good thing. This might be one of the reasons for its great effectiveness and vast popularity! The material it’s made of is S-glass fiberglass which is superior to the older E-glass fiberglass and provides better sensitivity. The ultra-durable S-glass blank construction is developed specifically for catfishing, this modern material made these rods stronger, lighter, and more durable. Far far better than an E-glass! In the handle section, it offers EVA foam grip handles, plastic reel seat. Though there’s plastic reel sit but it’s high quality, like many other anglers we never had an issue about that! So you can totally rely on it. The handle is built for dominating those toughest monsters with easily. The guides in these rods are made out of stainless steel with ceramic inserts which makes it corrosion resistant and durable and helps in smooth and accurate casting. There’s a cool feature in it, the glow-in-the-dark tip makes this rod so effective for night fishing. So, this Rippin Lips catfishing rod designed by the master catfisher John Jamison is a unique piece, a combination of power, durability, comfort in a very affordable price. One word for this rod, “incomparable”! You can also find Rippin Lips Super Cat spinning rods if you need! We put the links below. Check this out. Description: Tangling with catfish rods, we found this one for you! Introducing the Eagle Claw Catclaw, a powerful custom made casting rod for extreme catfishing. It’s a 2 piece rod, comes handy for traveling! I’m a fan of this casting rod, it’s really built for performance. And wanna know why I love this casting rod? This rod is a highly affordable one! Let’s go to the details of this rod. Well, folks, it’s a long rod, you cast a long distance with this one. The size of the rod is 8 feet, bank fishing or boat fishing with it is absolute fun. It’s a medium-heavy powered rod, we got enough power and leverage even for a giant size catfish. If you go for a 10-pound catfish, then it won’t be a problem with any rod. But if you planning for a trophy cat, then you must need a lot of power and this rod provides you exactly that. The action we got in this rod is moderate, well it’s good enough for catfishing. It’s made with an E-glass. On the lower end of the spectrum is E-glass. Well, this rod is very popular because of its strength and durability. Though it’s a bit heavier in weight and less sensitive than other styles of fishing rods. But it works perfectly. 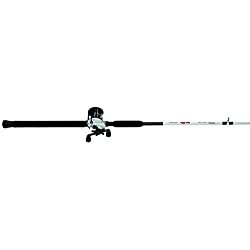 Like most other typical catfish rods, it offers EVA foam grip handles, features a graphite reel seat. The EVA foam grip provides good grip and comfort to handle even a rough and tough fight. The Eagle Claw casting rod has 7 aluminum oxide guides, this thing is pretty awesome! I found it so smooth while casting, all credit goes to its well-made guides. Let’s come to a verdict about this rod, if you want a powerful, durable, high-quality casting rod at a very affordable price, this is the rod you are looking for. We all know how this brand is making hooks and terminal tackle, but they are also making some good rods and it’s a great example. Give it a try! Description: Rod and reel combo is a great choice for beginners. Though it’s a baitcasting rod but then again, a rod and reel combo from the giant brand like Abu Garcia? 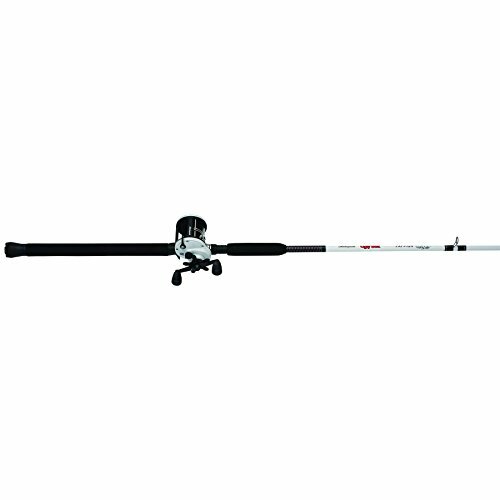 It’s great to have an Abu Garcia rod and reel combo cause this one is amazing. Matching a suitable reel for your catfishing rod can be overwhelming sometimes, especially for beginners! That’s why a good rod and reel combo saves the time and help you to get in the action fast. This rod has a pretty handsome height for catfishing. It’s a 7 feet long rod made for various kind of fishing and obviously catfishing. It’s totally ready to do some serious catfishing. Ultimately it’s a catfishing rod, so Abu Garcia offered a Medium Heavy power rod for your catfishing arsenal. It’s a pretty expensive rod, I must say! And it didn’t disappoint us. This rod has that such ability to catch a 40-50 pound flathead or blue catfish easily. This rod is a moderate action rod. Absolutely perfect for catfishing. From bank fishing to serious river fishing, it’s ready to accept any challenge. The 7-feet long catfish rod has a composite blank construction that makes it so durable but lightweight at the same time. 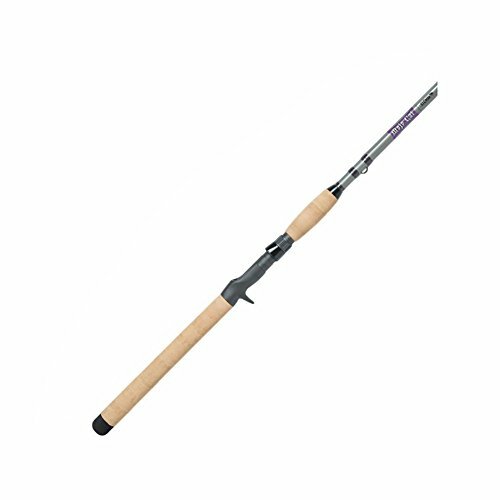 Fishing from shorelines, boats or from the bank a lightweight rod is very comfortable. They tried giving the light feel with this rod. So you can get the lightweight feel with this premium rod. Maybe there’s still an option to upgrade the handle section, like all other typical catfishing rods they used the EVA foam handle which is pretty comfortable, grippy enough to handle a monster but we always can expect something better from a premium rod like this one. Anyways, nothing wrong with this handle, it’s quite effective. It casting is so smooth, with stainless steel guides, there are 5 guides to make a more accurate cast. It’s a powerful 1 piece rod. Easy to travel anywhere because of it’s moderate height. Description: We are talking about the Shakespeare Ugly Stik Catfish spinning fishing rod here, a very famous rod among the catfishing anglers. The best thing about this rod is, there are many options about this rod which are pretty amazing. It’s also a good choice for catfishing in a very affordable price. Yup, you heard me right! It’s a good quality rod with several options at a very affordable price. Let’s dig deep into it! This rod comes with 2 different sizes, this one’s 8 feet long and also there are 2 more rods. One is a single piece 7 feet long rod and another one’s 2 pieces 7 feet long. Castability is better with this 8 feet long rod. Though it’s a pretty long rod you can carry it easily without any hassle cause it’s a 2 piece rod, you can separate em into pieces. So 8 feet is the better choice. The power of the rod is Medium heavy and you know it’s good enough for catfishing. I got that sensitivity needed for catfishing every time. It’s good for catching small-sized and medium-sized catfish. And for a giant one, well, to be honest, I never tried one. But I think it’s wise to not go for a trophy cat with this one. It’s a moderate fast action rod, the great action I must say! Like most other rods, it also has EVA foam handle which is comfortable and grippy. Absolutely no problem with the handle. It resists becoming slick and slippery when splashed with water. You will find other options in the link below. There’s spinning rod and reel combo, and other sized rods. Just pick what you need folks. Description: Introducing St. Croix Mojo Cat catfishing rod, this is the rod I love most, have been fishing with this for a long time and all I can say is it’s amazing! If you ask me which one I prefer from this list, I would say St. Croix Mojo Cat catfishing rod. It’s a spinning rod, the beginners gonna love it, I guarantee! These rods are available both in 7 and 8 feet long version. Choose the length you want, just remember you can cast a long distance with a longer rod, it will provide good leverage with the higher length, and carrying is easy for the shorter length. It’s a medium power rod. They tried to give you a lightweight feel, and for that, they calculated the power that way. It has a great power to go for a big cat. It’s a fast action tip rod, that means it will flex in upper ⅓ of the blank. It’s the perfect action you need to catch a flathead or blue cat. This St. Croix is one of the leading manufacturers in the business, and why not? They put the best materials in this rod and for that, it’s turned out to be a huge success. Made from a blend of SCII graphite and linear S-glass, which makes it a strong but yet very light in weight. That’s why the cat anglers love it, it’s a very powerful rod but very lightweight. unlike other catfish rods, the handles are made out of A premium-grade cork handle, which provides and ensures that you’ll be able to keep a secure grip on the rod. The handle is so much comfortable, trust me! The St. Croix Mojo Cat Spinning Rod is specifically designed for anglers chasing big cats. They tried to provide high quality to ensures the best quality as much as possible. they introduced Kigan Master Hand 3D guides with slim, strong aluminum-oxide rings and black frames. This really helped me for a smoother an accurate cast. We tried our best to show you only the best catfish rods in the market, now it’s your decision which one actually you wanna buy. At least we can guarantee you that, you won’t regret buying any of the rods from the list above! These rods proved their ability over the past years. Enough talk about catfish rods, did you ever considered a fillet knife for catfish? why don’t you have a look at our latest article on Top 8 Best Fillet Knife for Catfish where you will find some razor-sharp fillet knives for catfish or any other culinary job. So yeah, I guess that’s all! Let’s come to a verdict, shall we? Pick any of the rods but for a Premium rod option, you can pick the St. Croix Mojo. And for the best budget pick, try the Shakespeare Ugly Stik Catfish rod. Looking forward to hear more from you, till then Happy catfishing folks!